I spent many years training BT staff and managers on broadband technology, and now advise many home users on “getting connected”. I agree with the minister: people don’t understand why they should have to pay BT for a phone line if they never make or receive phones calls … they just want broadband. Many people (especially younger people) now make and receive calls only on mobile phones.At the moment, BT and customers think there is a “phone line” and that some people do broadband over it. In truth we have a “comms line” which some people use for broadband, some people use for phone calls, and some people use for both. There are two distinct things: (1) the physical connection, and (2) the service(s) which run over it. Until people understand that, there will be confusion. We should rent our “comms line” from BT Openreach (which should be taken away from BT and just called “Openreach”) and then just buy whatever services over our comms line from whoever at whatever price. That way we’d see what each element really costs, and there would be no cross-subsidy. Does maintaining a copper wire really cost £17.99 a month? 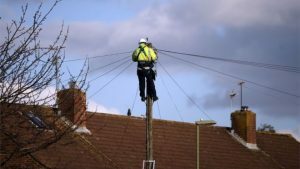 The “comms line” could also be provided by Virgin Media (as now) or by 4G mobile suppliers, and again regulation should separate the “comms line” from the services which use it … so we’d be able to buy phone, broadband, and maybe TV from any supplier who was willing to provide service over our comms line. So if I have a Virgin Media cable line, I should be able to get phone and/or broadband service over that line from suppliers other than Virgin. hidden cross-subsidy and lack of competition. Previous PostWindows Vista – Should I Upgrade?Next PostTime to upgrade to Windows 10? So why do we still pay 17 a month for a landline that few of us use and even fewer actually need? Doesn’t it feel like a waste of money to be paying for this on top of your monthly broadband subscription? Isn’t it just a con that you can’t get online with most of the headline broadband providers without being forced to pay for a hardly-used voice line on top? It’s not a “voice line” though, is it? It’s just a line – can be used for voice, for broadband, or for both. Openreach provide the line, and it seems reasonable that I pay them to provide and maintain it. Then I could seperately pay other people for broadband (if I want that) and/or calls (if I want them). Thank you for your email of 23 March, to the Department for Culture, Media and Sport (DCMS), about line rental charges. I am replying as a member of the DCMS Ministerial Support Team. The Department firmly believes that landline rental charges are outdated and Ed Vaizey has recently spoken out against them, saying that they are an analogue charge in a digital age. We are aware that separate landline charges for broadband services may appear to be misleading. The Department believes that the true cost of service should always be made clear to customers. This includes ensuring that charges are not hidden away in small print, or deliberately separated from the broadband price presented to consumers. This should also be the case at point of sale and on bills. I would like to assure you that some progress has been made. The Advertising Standards Authority (ASA) plans to tackle misleading pricing information, including the way line rental charges are presented. It will introduce a new set of standards next month, which will simplify the presentation of price information and ensure that all costs required to obtain a service are clear to consumers and do not mislead. It proposed in January that those standards could require providers to include line rental charges within a single headline price, or with suitable prominence. The Minister is calling a meeting soon of all the major telephone companies to see if this outdated way of charging people will finally disappear. The meeting will consider many different alternatives, and I thank you for presenting your plan to the Department.